1B/OF Eric Thames, 30, who is now a free agent after playing with the NC Dinos this year, will most likely be playing his next season in NPB (Nippon Professional Baseball)… as Thames, and his agent, are currently negotiating a deal (one-year) with the the Fukuoka Softbank Hawks, of the Pacific League, via link. 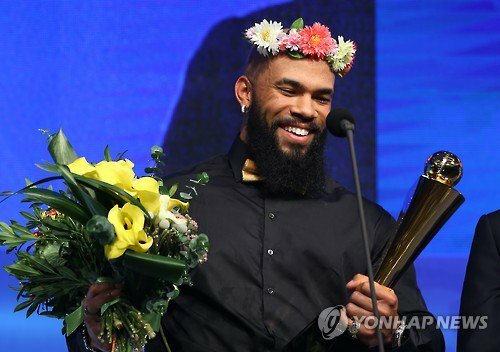 Eric Thames has been attracting a lot of interest among MLB and NPB teams after posting 3 very solid seasons in the KBO (Korean Baseball Organization) hitter-friendly league. In 390 games (1351 AB) in the KBO, Eric Thames owns a batting line of .349/.457/.721 with 124 homeruns and 382 RBI, he also has 64 stolen bases in that span, with 40 SB (career high) last year with NC. Eric Thames is also a 3 time all-star in the league, and is the season league MVP in 2015. According to MLB Trade Rumors, they listed Eric Thames at #45 in the top 50 Free Agents of 2016-2017. He looks like a sacrificial maiden in that photo. What are they going to do, throw him into Mount Sakurajima when the season ends?